When I got engaged, the best gift I received was a subscription to a bridal magazine. It was so helpful to read through the magazine and get ideas. I'll be honest. At first, looking through the magazines was super overwhelming. The magazines were filled with possibilities and had advice for things that I hadn't even thought about yet. When I finally got into wedding planning, the magazines were less intimidating and were simply helpful. If you're starting planning, you definitely want a wedding magazine. 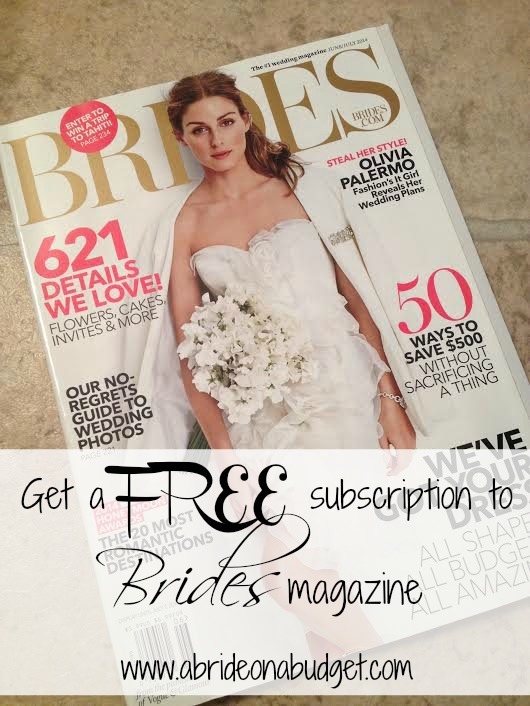 Right now, you can get a free subscription to Brides magazine from Rewards Country. Click that link, enter your information, and take a quick survey. You'll be rewarded with a free subscription. I've gotten a ton of magazines free from Rewards Country, so it's completely legit. I currently have a subscription to Brides magazine. Each issue is really thick, but that's because it's very ad heavy. I usually don't like ads in magazines, but ads in bridal magazines are actually really helpful since you do need to order a lot of items. So the more ideas you can get from ads, the better. Free subscriptions don't last forever, so definitely subscribe now (or sign up your engaged friends. They'll thank you). BRIDAL BABBLE: Do you subscribe to bridal magazines? I remember going to the library to read this when I was planning a wedding (many years ago). Thanks for the info. I get overwhelmed, too, when there are too many choices from which to make a decision. Oh thank you! I am going to sign up now! This is a very good magazine to get because it shows all the latest styles of dresses and what needs to be done for a wedding. Thanks for the heads up for a free magazine. I have never subscribed to them before. My friends cousin is getting married. This will be helpful to her, I will have to sign her up. No, I do not subscribe to Bridal magazines. Thanks for this, this is an awesome freebie. Thank you for the free subscription to bride's magazine. I will sign up. how long does it take to arrive from the time you order it. I am getting married in 94 days and debating if it is worth it at this point. I'm not sure how long it will take, to be honest. But you can always request it and if it doesn't arrive in time, you can give it to a friend who is getting engaged, donate it to the library or a hair salon, etc.